Just a decade ago, grape tomatoes were largely an unknown fruit. They seemed to hit the marketplace by storm. These cherry sized, egg-shaped fruit, are firmer, but not as sweet as regular cherry tomatoes. Gardeners like you and me, quickly added them to our gardens. Now, our vegetable gardens would not be complete without them. In the marketplace, grape tomatoes have quickly become very popular, despite a higher price tag. Being a little smaller than cherry tomatoes, it take more effort to fill a container for the marketplace. As gardeners, we give little or no thought to the extra time to harvest. The taste is well worth the effort! Growing Tip: Plant grape tomatoes at the edge of the garden. Kids and adults will come right up for a tasty, right from the garden snack. Generally speaking, grow grape tomatoes just like any tomato variety. Like other tomato plants, it prefers full sun, and a rich garden soil. It is best to start your grape tomato plants indoors. Plant grape tomato seeds in small containers, eight to ten weeks before the last frost date for your area. You can also start seeds in a cold frame. Just prior to planting seedlings in your garden, "harden them off" by bringing them outside during the daytime and for increasing hours, until you are leaving them out overnight. Use of a cold frame is recommended, but not a requirement. If frost is predicted, bring them indoors. On planting day, pour liberal amounts of water with a soluble liquid fertilizer on them. Plant them in the garden carefully. To minimize transplant shock, avoid disturbing the roots. Normal spacing is 24 " apart, in rows 30" to 36" apart. Fertilize plants, on a regular basis. Early applications should be high in nitrogen. As soon as flower buds begin to appear, switch to fertilizers which are higher in Phosphorus and Potassium. Too much Nitrogen fertilizer results in lots of lush green leaves, and little fruit. A fertilizer specifically formulated for tomatoes, will help to maximize your crop. Keep your grape tomato plants well watered. Deep watering is preferable, over more frequent, light watering. You want moisture to go deep to all the roots of the plant. Water directly to the roots. Keep water off the leaves if at all possible. Tomatoes are susceptible to plant disease that grows in wet, humid conditions. Caging or staking grape tomatoes, is highly recommended. We consider it a must. You can also plant them next to a fence, and tie them to the fence as they grow. Grape tomato plants grow at about the same speed as other tomato plants. The small fruit takes less time to grow and ripen. The fruit should begin to ripen about 70 days after you set seedlings out into the garden. Cold and hot spells affect fruit development and growth. Fruit set does not occur below 55 degrees, or above 90 degrees Farenheit. 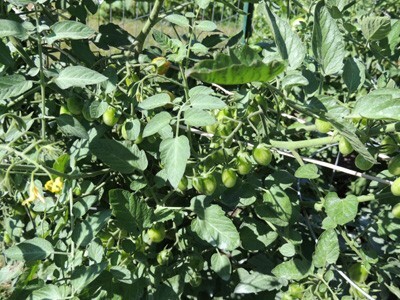 Grape tomato plants are prolific producers. Continuously harvest ripe fruit. This will promote new flowering and fruit set, for a maximum harvest. Tomatoes experience insect problems with cutworms and a few other garden pests. Also, if not staked or caged, snails and slugs will munch on the ripening fruit. Deer will nip the young, tender growing tips of the plants. A number of plant problems can arise, usually in mid summer heat and humidity. Blights and fungus infections can occur in the high humidity. Early treatment with fungicides is effective. Spacing plants too close cuts down air circulation and promotes disease. Blossom end rot can also affect the fruit. This is a round, brown, indented spot on the bottom of the tomato. It is caused by either uneven watering or a lack of calcium in the soil. More on Blossom End Rot. Tip: Do not water at night if possible in hot and humid weather if possible. Moisture and humidity combined with high temperatures promotes plant diseases. If possible, water at the roots. Tomatoes like it hot! They will die if exposed to frost. Make sure to plant them after the last frost. Tip#1: Cover your young seedling if frost is predicted. A simple and easy cover for small seedlings is to buy large or extra large plastic disposable cups. Place them over the seedling at dusk, and remove them in the morning. There is usually little or no wind on nights with frost, so they are not easily tipped over. Tip#2: If you get a light frost overnight and you did not cover up your plants. Go out early before the sun rises, and spray your plants with the garden hose. This melts the ice off the plants and may save them. Harvest grape tomatoes anytime from when they begin to turn pink, to when they fully ripen into a bright red, color. Store ripe grape tomatoes on a counter top, or any cool, dry location. Do not put them in the refrigerator.